While our society values the newest, the costliest, and the flashiest, I'm motivated to rediscover that which has been ignored, forgotten, or cast aside. By using the inherent drama of black-and-white photography, I'm able to capture the essence—the élan vital—of these subjects. To me, the abandoned houses and rusting automobiles dotting the countryside retain a special energy left behind by their former owners. I sense this energy being particularly strong around an object made by hand—an oak balustrade, a marble cemetery statue, a forged iron gate. I also find it clinging to derelict machinery and old factories where skilled workers practiced their craft. In exploring back roads and out-of-the-way places, I've been pleased to discover fascinating aspects of Indiana's unique heritage. My goal is to preserve, on film and in books, the richness, significance, and value that surrounds us—yet often goes unnoticed—so it can be experienced and appreciated by others. John is an Indiana Artisan, and has been named a Distinguished Hoosier. For John's resume, click here. For information about how John creates his photographs, click here. 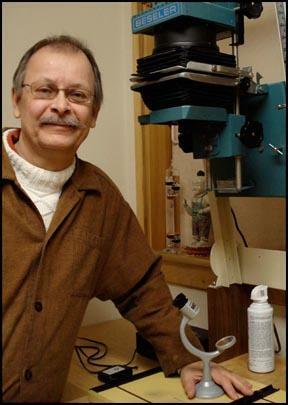 To visit John's darkroom, click here.